The above chart is of interest because it shows some Dutch Brazilian ancestry of the Barrows (and thus of those Baruch Lousadas descending from Jacob Barrow, but see also note 4 below). Our clue to this is that the 'Jael' name came to Barbados from Dutch Brazil with Jael Valverde (ref 5 p25 - our page numbering). 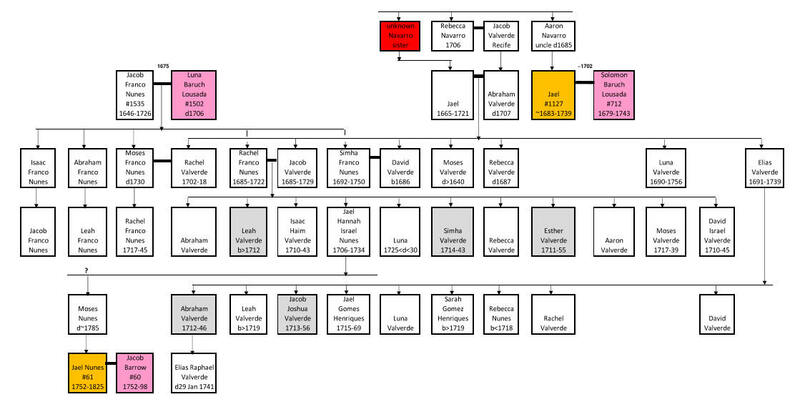 Due to the flourishing of the Valverdes (see note 1 below), and their intermarriages (with families such as the Franco Nunes as shown above), the number of Jaels rose to 30 quite quickly. As can be seen from the chart, Solomon Baruch Lousada and Jacob Barrow each had a wife named Jael. To explain how this connected them, we suggest that the father of Jael Nunes was an offspring of the Jael Hannah Valverde and Abraham Israel Nunes marriage (see note 2 below). We also suggest that though the wife of Solomon Baruch Lousada could have been a daughter of the original Jael Valverde we lean towards his wife being a suggested cousin Jael (Navarro - see note 3 below). Interestingly, while the chart shows that the Barrows had a Jael/Valverde link to the Barbados Baruch Lousadas, they also had a direct link to the Amsterdam Baruch Lousadas. Thus Luna #1502, the daughter of Isaac #42, married Jacob Franco Nunes in Amsterdam (see note 7 below). Accordingly the chart shows that Jacob Barrow, who married Jael Nunes in 1786 (see note 8 below), married a great-great-great-granddaughter of Isaac #42; on the other hand, Jacob Barrow was probably a great-great-great-grandson of Isaac #42 because of the Livorno origin of the Barrows, thus making Jacob a 4th cousin of his wife. Solomon #712's father Aaron #376 was a stepson and probable nephew of Isaac #42. In addition to these further connections we find that Jael Valverde 1715-69 and her sister Sarah - Elias' daughters - each married a Gomes Henriques (see note 5 below). Click here for a recent Lousada/Valverde interaction! The preparation of the above chart arose during our search for a link between Judith Lindo and Sarah Baruch Lousada (the younger David's wife), but no suitable pair of candidates emerged from the 20 children of Jacob and Elias Valverde. 1. Much of our data came from ref 5 and ref 61. In addition to these sources, we consulted http://americanjewisharchives.org/publications/fajf/pdfs/stern_p302.pdf which drew upon ref 61 as we did, but used other sources as well - which we have not yet verified. These additional sources allow this reference to conclude that the wife of the original Jacob Valverde was Rebecca Navarro (ref 5 notes that Aaron Navarro - who came to Barbados via Surinam - was Abraham Valverde's uncle) and that Jael Hannah Valverde married Abraham Israel Nunes (whereas ref 5 by showing that Jael Hannah was not in the will of her uncle Moses Franco Nunes might allow an inference that she had died before marriage - but now it seems she was absent perhaps because she already had her dowry!). Amongst the 20 children of Jacob and Elias Valverde (according to ref 207 - while ref 5 gives an extra 2 sons of Elias but no names), 6 names correspond, 2 of them reflecting their common paternal grandparents Abraham and Jael Valverde. There were, unsurprisingly, some cousin/cousin marriages (see note 6). Ref 207 PTII also notes there were 4 children of David (brother of Jacob and Elias) - one of which Jael Hannah died 21 Oct 1742 aged 26 years 2months (ref 61 #48). David's wife Simha died 20 Jun 1750 aged 58 years (ref 61 #48a). Ref 207 PTIII gives an extensive account of the Valverdes in connection with Bridgetown property ownership in the mid-1700s. 2. This suggestion is only indirectly supported by the evidence. It means that Jael Nunes was named after her paternal grandmother. However we do not know who the father of Abraham Israel Nunes was and thus we cannot link her father's name 'Moses' to Moses Franco Nunes who had only one child Rachel. Certainly the timing appears correct. 3. Broadening ref 5, we accept a Brazil origin of the Jael name but take it back to a grandmother Jael Navarro. The evidence only weakly supports this. Certainly the age difference between the first 2 Jaels as shown above is consistent with a brother/sister relationship of the parents, and on general grounds it is unlikely that Solomon's wife Jael would have been a daughter of Jael Valverde (such a circumstance would have meant her mother was also a Jael given that the other grandmother was Rebecca - but we should not refrain from noting that this is exactly what happened with the Livorno/Amsterdam Baruch Lousadas which shows 3 successive generations of Luna one of whom was Luna Franco Nunes shown in the chart!). A Jacob Baruch Lousada witnessed the 4 Jul 1685 will of Aaron Navarro (ref 5 p50 our numbering) - this was probably Jacob #711 son of David #44, for Jacob #1388 died in Amsterdam in 1681 and Jacob #380 was born in 1681. This will does not show the existence of Jael a daughter of Aaron Navarro, which casts doubt on our suggestion - but perhaps Solomon's wife Jael was the daughter of one of Aaron's brothers Moses or Jacob who do appear in the will. 4. Gracia, aunt of Solomon Baruch Lousada #712, brought the Baruch Lousadas into contact with Brazilian Sephardic Jews when she married David Raphael de Mercado who came to Barbados in 1655. She does not however seem to have left any descendants. 5. Jael married Abraham Gomes Henriques 1708-62, presumably a relative of Rachel Gomes Henriques 1650-1703 #377 who was Solomon's mother and a key ancestor of the Baruch Lousadas. Sarah married Abraham's brother (details from ref 207 PTII p27). 6. Indeed ref 209 informs us that the brothers Abraham and Jacob Valverde married their first cousins Esther and Leah Valverde. Ref 61 shows a marriage of Jacob and Simha - she died in 1743 - and this marriage may have been Jacob's first and thus another marriage of first cousins. 7. In Amsterdam, on 6 Elul 5435 (from http://www.dutchjewry.org/phpr/amsterdam/port_isr_gem_marriages/amsterdam_port_isr_gem_marriages_view.pp?editid1=35), Luna Baruch Lousada married Jacob Franco Nunes! Ref 61 (#25 and #26) shows a pair with these names buried in Bridgetown. As can be seen in ref 213, there were few Franco Nunes in Amsterdam, and one of them - Joseph, possibly an uncle of Jacob - acquired a Valverde aunt through his 1659 marriage! 8. Jacob married Jael Nunes at Bevis Marks in 1786, being listed as #1214 in Bevis Marks Records Part II, with the date 15 Heshvan 5546.